Today is Benazir Bhutto's second death anniversary. Benazir Bhutto was the first lady to rule any muslim country in this world. She was also one of the most influencial leaders of South Asia. 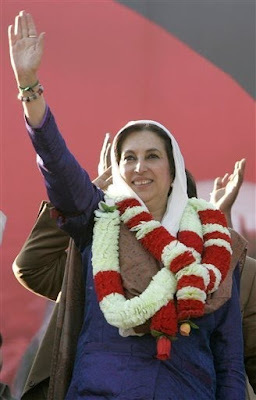 Benazir Bhutto was born in Karachi, Pakistan to a prominent political family. At the age of 16 she left her homeland to study at Harvard’s Radcliffe College. After completing her undergraduate degree at Radcliffe she studied at England’s Oxford University, where she was awarded a second degree in 1977. Later that year she returned to Pakistan where her father, Zulfikar Ali Bhutto, had been elected prime minister, but days after her arrival, the military seized power and her father was imprisoned. In 1979 he was hanged by the military government of General Zia Ul Haq. Bhutto herself was also arrested many times over the following years, and was detained for three years before being permitted to leave the country in 1984. She settled in London, but along with her two brothers, she founded an underground organization to resist the military dictatorship. When her brother died in 1985, she returned to Pakistan for his burial, and was again arrested for participating in anti-government rallies. She returned to London after her release, and martial law was lifted in Pakistan at the end of the year. Anti-Zia demonstrations resumed and Benazir Bhutto returned to Pakistan in April 1986. The public response to her return was tumultuous, and she publicly called for the resignation of Zia Ul Haq, whose government had executed her father. She was elected co-chairwoman of the Pakistan People’s Party (PPP) along with her mother, and when free elections were finally held in 1988, she herself became Prime Minister. At 35, she was one of the youngest chief executives in the world, and the first woman to serve as prime minister in an Islamic country. Only two years into her first term, President Ghulam Ishaq Khan dismissed Bhutto from office. She initiated an anti-corruption campaign, and in 1993 was re-elected as Prime Minister. While in office, she brought electricity to the countryside and built schools all over the country. She made hunger, housing and health care her top priorities, and looked forward to continuing to modernize Pakistan. At the same time, Bhutto faced constant opposition from the Islamic fundamentalist movement. Her brother Mir Murtaza, who had been estranged from Benazir since their father’s death, returned from abroad and leveled charges of corruption at Benazir’s husband, Asif Ali Zardari. Mir Murtaza died when his bodyguard became involved in a gunfight with police in Karachi. The Pakistani public was shocked by this turn of events and PPP supporters were divided over the charges against Zardari. In 1996 President Leghari of Pakistan dismissed Benazir Bhutto from office, alleging mismanagement, and dissolved the National Assembly. A Bhutto re-election bid failed in 1997, and the next elected government, headed by the more conservative Nawaz Sharif, was overthrown by the military. Bhutto’s husband was imprisoned, and once again, she was forced to leave her homeland. For nine years, she and her children lived in exile in London, where she continued to advocate the restoration of democracy in Pakistan. In the autumn of 2007, in the face of death threats from radical Islamists, and the hostility of the government, she returned to her native country. I saw the news when she was assassinated I felt bad at that time. She is great lose to everyone.